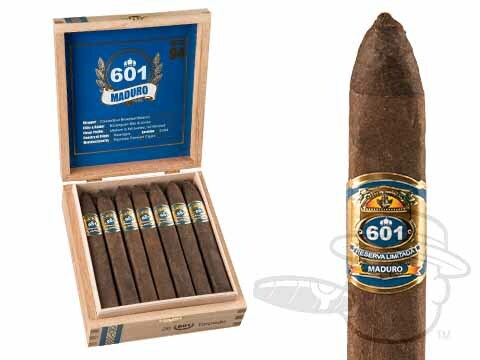 Boasting beautiful box-pressed construction and bold maduro taste in every puff, the 601 Blue Label Maduro is your ticket to deep, satisfying flavor with tones of earth, coffee, almond, and more. A blend recipe of aged Cuban-seed long-leaf tobaccos under a dazzlingly dark Nicaraguan wrapper gives way to a rich and complex medley of tasting notes punctuated by just the right touch of peppery spice. If you're looking for a full-bodied smoke with real balance and character, look no further - these immaculately rolled top-shelfers are certain to fit the bill.